Figure 1. 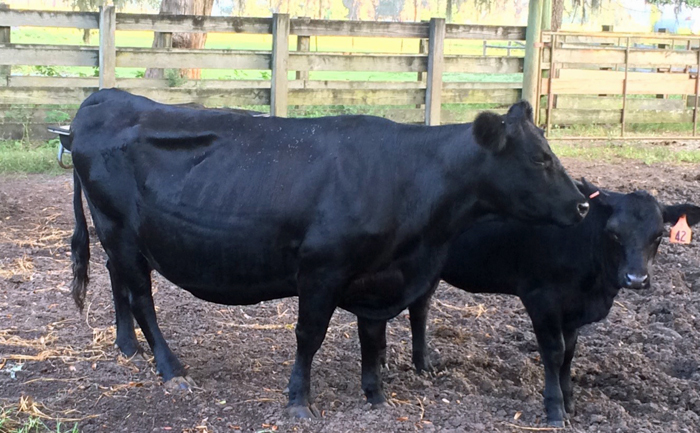 Body condition of Cow-calf pairs shortly after calving affects milk production and reproductive success. (Gainesville, FL; Photo credit: Matt Hersom). The body condition score of a cow and the herd overall is the best indicator of past nutritional status or success of the overall nutritional program, and the best indicator of near-term nutritional needs. Body condition score is an assessment of the fat cover that the cow is carrying. Surplus nutrition (energy) causes fat to be deposited; whereas an energy deficit causes fat to be mobilized (used). The amount of fat present also has an influence on the hormones and physiology of the cow. If you are not familiar with body condition scoring your cow herd, you should be. Cows are scored from 1-extremely thin to 9-obese. If you want help, contact your local County Extension Agent who can help train your eye. It is the least expensive, but greatest return management technique that a cattle producer can adopt. Unlike other management techniques body condition scoring is free, can save feed resources and dollars, and can increase returns to the cow herd enterprise. Cow herd nutrition is a year-round concern. The cow’s nutrition can’t always be relegated to minimal input supplement choices in the fall and winter; rather cow nutrition is an on-going assessment of the balance of cow requirements and nutrient supplies. The attention to cow herd year-round nutritional status arises for two primary issues. First is the relationship of nutritional status, body condition score, and cow herd reproductive productivity. The body condition score of the cow herd has a lot to do with reproduction, and reproduction has everything to do with profitability. Second is the concept of cow nutrition during gestation impacting offspring performance – referred to as fetal imprinting or fetal programming. Numerous studies have examined the effect of cow body condition score on any number of reproductive and productive traits. 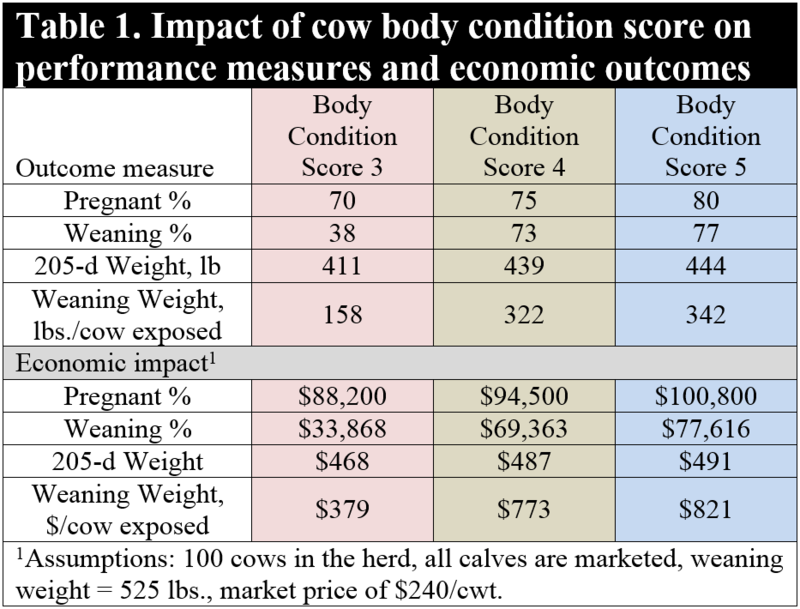 Analyzing data from three studies that cover a range of body condition scores and locations provides a nice summary to which we can apply some simple economics examining the economic impact of cow body condition. The second issue is the concept of cow nutrition during gestation impacting offspring performance – often referred to as fetal imprinting or fetal programming. The developing fetus is completely dependent upon the dam for its nutrient supply from conception until sometime before weaning. As a result, any nutritional insult to the cow may result in a nutritional insult to the developing fetus. Throughout gestation there are critical points of development for the fetus: development of the digestive system and reproductive organs, fat cell appearance, blood flow through the placenta, and growth of all tissues. Critical shortages of key nutrients including protein/amino acids, fats, vitamins, mineral, and cow energy supply can result in sub-optimal development in the growing fetus. We already know that decreased energy supply to the cow can affect placental development, fetal development, calf birth weight, and ultimately reproductive performance. Additionally, if their dam was nutrient restricted during gestation, sickness and death rates increase in those calves even after they are born. Recent work in cows has identified protein supplementation and higher quality forages as important contributors to improved reproductive performance in heifer offspring, through decreased age at puberty, increased pregnancy rate, and an increase in the percentage of heifers that calved in the first 21 days of the calving season. Additionally, steer progeny had greater weaning weights, feedlot average daily gain, carcass weights, and better carcass quality. Often our cow herds experience periods of nutritional restriction during the annual production cycle. Nutritional restriction of the cow not only affects her ability to maintain herself, but also affects the cow’s ability to become pregnant, maintain pregnancy, and can negatively affect the developing calf. Early nutritional restriction of the cow can affect placental development and the cow’s ability to deliver nutrients to the fetus. Late nutritional restriction of the cow negatively affects the development of organs and uptake of nutrients by key tissues. The opportunity to negatively or positively affect a calf crop and the economic return from the calf crop ultimately starts with cow nutrition and adequate body condition both while pregnant and after calving. Figure 2. Cow body condition has long-term effects on calf weaning weight and total cow economic productivity. (Alachua, FL; Photo credit: Matt Hersom).